KITS There are 22 products. A set containing Genesis Base C3 tripod and BH-34 ballhead. Genesis Base C5 Kit gray is a set containing a carbon fibre Genesis Base C5 tripod and a Genesis Base BH-40 ballhead. 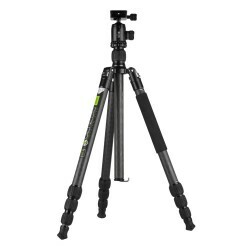 Genesis Base C5 Kit green is a set containing a carbon fibre Genesis Base C5 tripod and a Genesis Base BH-40 ballhead. Genesis Base CCVT-20 Kit - Genesis Base CVT-20 Kit includes a Genesis Base CVT-20 video tripod and a VF-7.5 video panning head. Genesis Base C5 Kit blue is a set containing a carbon fibre Genesis Base C5 tripod and a Genesis Base BH-40 ballhead. Genesis Base C5 Kit orange is a set containing a carbon fibre Genesis Base C5 tripod and a Genesis Base BH-40 ballhead. Genesis Base C3 Kit orange is a set containing Genesis Base C3 tripod and BH-34 ballhead. Genesis Base C3 Kit blue is a set containing Genesis Base C3 tripod and BH-34 ballhead. The Genesis Base Mini ABT Kit is a compact, travel-friendly set that consists of the Mini ABT Tripod and the ABH-36 Ball Head. Genesis Base CCVT-10 Kit - Genesis Base CVT-10 Kit includes a Genesis Base CVT-10 video tripod and a VF-6.0 video panning head.